When it comes to entertaining and feeding 100+ wedding guests, it's statistically impossible to please everyone. If you took into consideration that your brother-in-law has peanut allergies and your great Aunt Milly only eats egg salad sandwiches, you'd end up with a pretty sparse menu. That's why food stations and "make your own..." bars are so popular at weddings. It's the easiest and most affordable way to provide your guests with options. And who doesn't love having options? 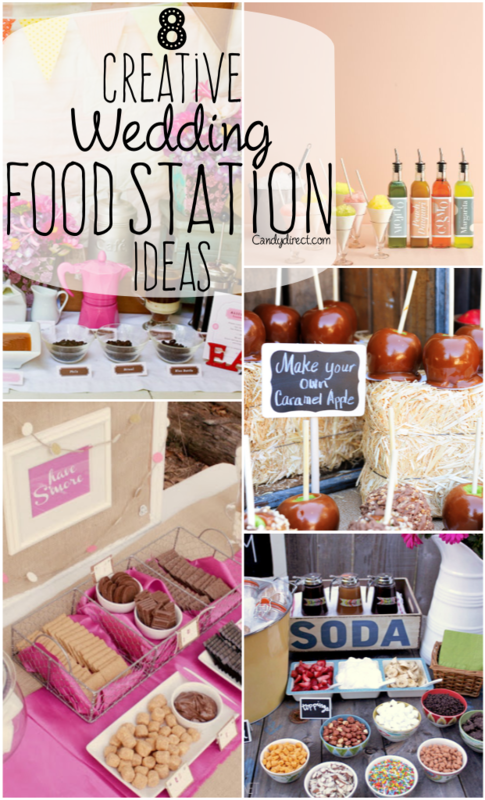 We've put together 8 of our favorite, most creative food stations to inspire you to come up with your own. 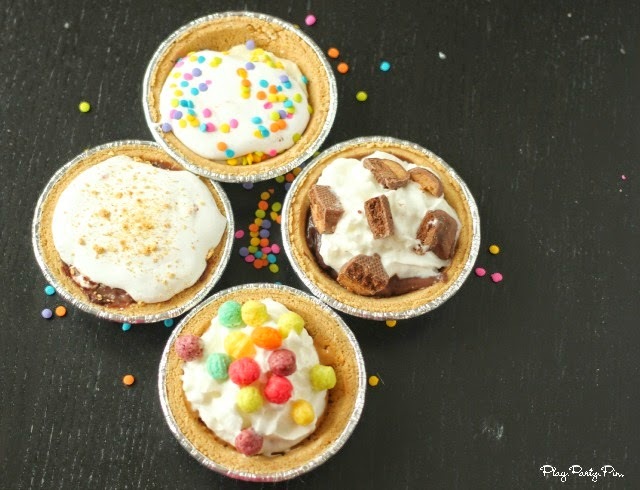 Pudding is a wonderful pie filler; and considering the wide range of pudding flavors, the possibilities are endless! Some Jell-O pudding flavors include banana cream, egg custard, flan, pistachio, white chocolate, and coconut. Purchase individual mini pie crusts and keep them in the mini tins. Pick out a few puddings and some complementary toppings to go with each flavor. If you're getting hitched on Pi Day, you have no excuse; pin this now. 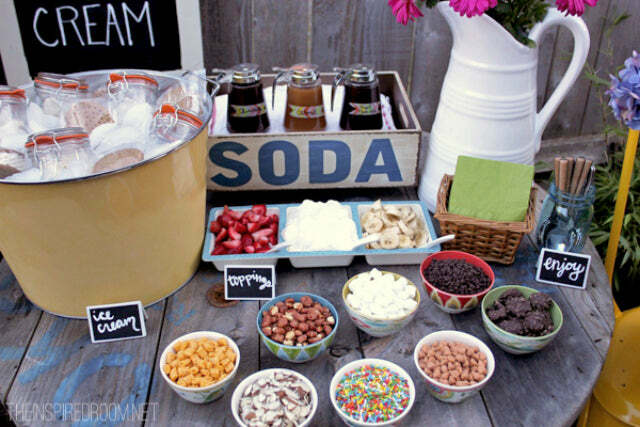 A snowcone station is an adorable idea, especially for a summer wedding. If you want to add a little more snazz, make it adult-themed by making the syrup alcoholic. 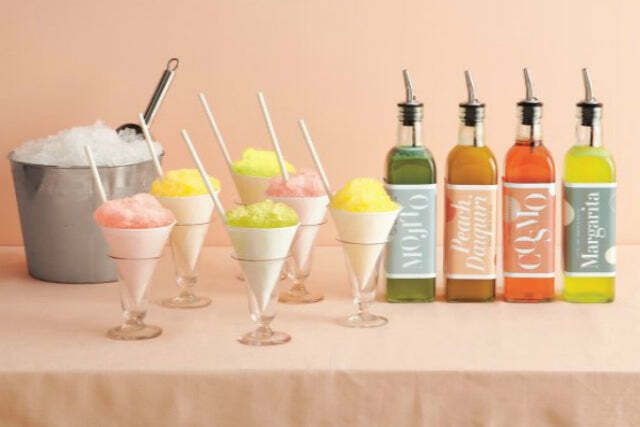 You can turn popular drinks into snowcones by making syrups like margarita, mojito, peach daiquiri, and countless others. To make it look more like a cocktail, place the paper cones in fancy glasses. 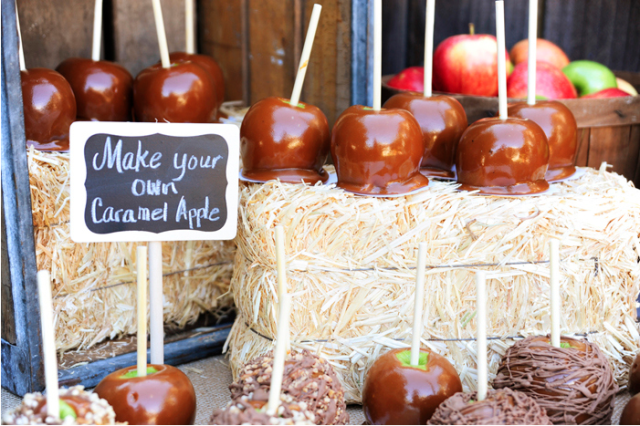 A caramel apple station is a great idea for fall weddings. You can choose to use whole apples or slices, and they'll be a hit either way. This "apple affair" themed event from Amy Atlas features mini apple pies, apple cider, and deconstructed mason jar apple pies. Include a mix of red and green apples, and include white and dark chocolate with the caramel to give your guests more to choose from. 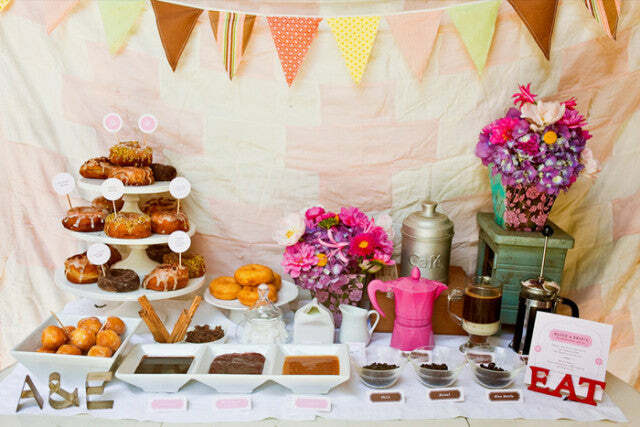 An ice cream sandwich bar would probably please even the pickiest eaters at your wedding. 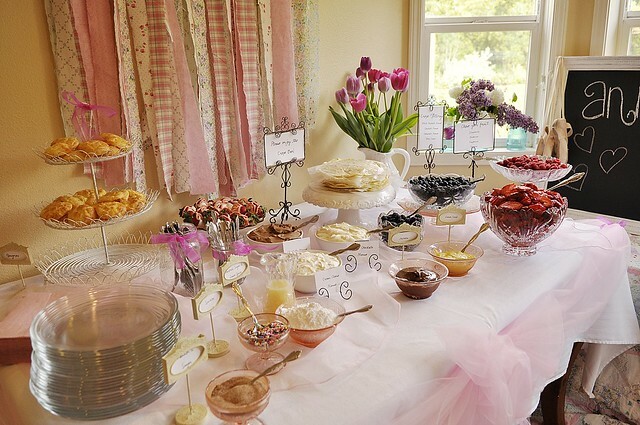 Offer a variety of cookies, ice cream, and toppings, and your station will not only look fabulous, it will satisfy every type of sweet tooth. We also like the idea of a Double Doozie bar. It's like an ice cream sandwich, but has icing in the middle instead of ice cream. If you're worried about keeping the ice cream cool, a double doozie station might be a safe alternative. Check out the double doozie recipe at Confessions of a Cookbook Queen. Whether you're having a morning wedding or a nighttime wedding, doughnuts are a hit no matter what time of the day you eat them. We love the idea of making your own doughnut holes using different sauces and toppings. There's also a nice setup of pre-made doughnuts, for the guests who would rather pick out a ready made doughnut. S'mores are a historically social dessert, and are perfect for wedding receptions. 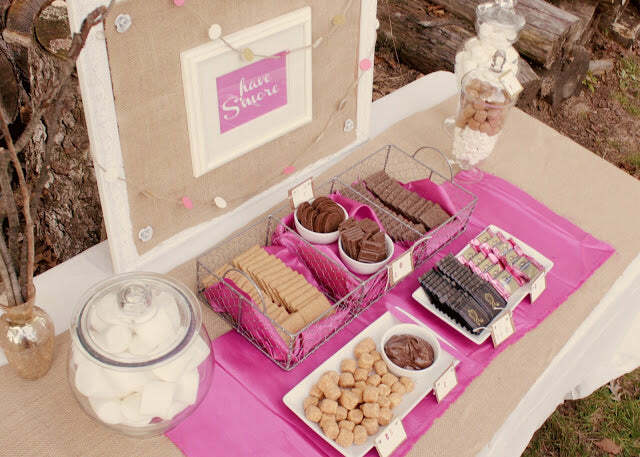 If you're having an outdoor wedding, setting up a s'more bar and fire would be a great way of bringing your guests together at the end of the night. Imagine all of your friends and family standing around a fire, eating s'mores, and watching fireworks. How much better could it get? 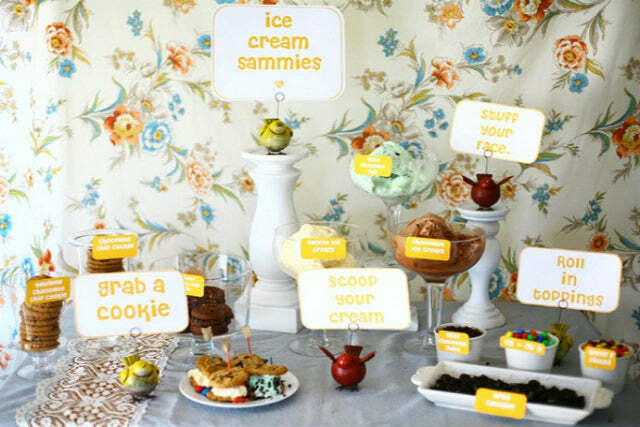 Sundaes are a traditional all-American dessert, and could be an adorable "make it" station for your guests. Mix it up by putting pre-scooped ice cream in individualized mason jars. That way, your guests don't have to scoop it themselves and risk getting messy! For a low-cal option, throw some Skinny Cow ice cream sandwiches in the bucket. These French pancakes are ideal for weddings, especially if you're opting for a French or Parisian theme. They are served with a variety of fillings, either sweet or savory. If you're opting for sweet, you'll need different types of mousses (or whipped cream) and fruit.